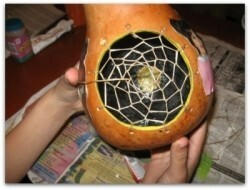 Here you will learn the steps to make a Dreamcatcher Gourd. I have included step by step directions for turning an ordinary Gourd into a Dreamcatcher Gourd, plus directions for making this, or any, dreamcatcher. Gourds are a wonderful median for arts and crafts and many artisans have turned to using them for their versatility. I love making Native American Themed Arts and Crafts, and have made a few Dreamcatcher Gourds as special gifts. The Dream Catcher Gourd Tutorial I made here can be done in a different order after the first 7 steps. Once you have the basics done, a few of the steps can be out of order, all except step 11 of actually weaving the dreamcatcher. The first 7 steps are the ones that are the most important. You want to make sure your gourd will sit up straight, then you need to wash the outside. These are hard shell gourds that have dried outside so there might be some mold on them. You can soak them in bleach water (make sure they are submerged, and don't forget the stem). Afterward let it dry....then you are ready to draw the circle, cut it, then clean out the inside, and sand the rim. NOTE: Gourd Dust can be toxic...wear a mask or a respirator and work outside to alleviate the gourd dust from settling inside the house. Gourds are naturally beautiful and you can do just about anything with them. When my grandkids needed a gift for their mother, I looked at the few gourds I had and we decided to make a dreamcatcher gourd for her. Incorporating a dreamcatcher into a gourd is relatively easy, but there are several steps that need to be taken before you can make the dreamcatcher. Step 1: Select a gourd that stands up straight- you want the focal point of the dream catcher to be in the middle. Step 2: Clean the outside of the Gourd, then after it's dry, draw a circle with a pencil. Step: 4: After Step 3 go deeper into the gourd until you have broken through the shell (now you have a small hole. Use the cutting tool and cut out the circle. Step 6: After the inside is cleaned out and sanded- take a pair of pliers and cut off the piece of stem on the bottom of the inside if it isn't flat already. Step 8: Make the holes for the Dreamcatcher....small holes about 2-3 inches apart...on the penciled circle or just above. Make at least 8 holes the same diameter. The Dremel has a bit that will be perfect for this... just hold the gourd and poke the holes through. Step 9: Tap any dust out of the inside again...and take a damp cloth to get any residue out.....then paint the inside whatever color you choose. Step 10: This is the time to do the outside ...I use shoe polish to just give a little sheen but keep the natural look of the gourd, but you can design it anyway you want. Don't forget to also paint the rim of the large circle, or if leaving the outside natural you could also leave the rim natural. Step 11: After everything you want to do has been done it's time to make your Dreamcatcher. The most important thing to remember is to keep your thread tight....here are directions for how to make a dreamcatcher. The first step is to choose your Gourd. A Dreamcatcher Gourd should have a big enough surface that is in the middle, and can stand up by itself. Gourd farms are great places to find gourds, but you can also buy them retail. Gourds usually have thin layers of mold and need to be cleaned before design work. After washing the outer part of the gourd you will draw the design then cut the circle. Most of the gourds are thick, and it's best to use a Dremel Tool (or something similar) to start a hole, the cut around the circle. Go slow and don't worry if you aren't following the line exactly as you can erace the pencil marks, plus you will be sanding the rim of your cut anyway. Cleaning out the inside of a gourd can be messy. Here you can see how to clean your gourd on my other article that also tells you what a gourd is, and other info. You can save the seeds for planting, but you can also save them for other craft projects, like making a necklace. Later you can paint the inside, but first you want to do all your sanding and drill your holes for the dreamcatcher part of your project. After you cleaned the gourd out it is time to sand the circle. If you cut it a little lopsided you can fix it in this step, just sand it. You can sand by hand, but a dremel tool is so much easier. Make a little lip around the hole..you don't have to, but it helps blend the inside with the out. Make sure you erace any traces that might be left of the pencil line you drew. Using your dremel drill 8-10 holes evenly placed around the hole. Start at the top and work your way around. It's best to visually "see" the holes and count how many holes you need first as you want to keep them about the same distance apart. Be careful if you have never worked with gourds, and keep a steady hand. Our gourd had one hole bigger than the others but once my grand daughter figured out how to make the holes the rest were the same diameter. In the end it doesn't really matter, as it is YOUR art piece! This step can be done before you drill the holes, but I prefer to do it after. When you drilled the holes you will have a little residue dust which you will want to tap out of the gourd, then wipe the inside out again with a damp cloth. You can paint the inside with a theme or anything you want, or just paint a solid color. The outside can also be painted, or stained. For our project I had the kids stain the outside with shoe polish, then after it was dry they were ready to weave the web of the dreamcatcher. OK, now you're ready for the final step....make your dreamcatcher. Here's the link again, in case you missed it above on how to make a dreamcatcher . Start with the top hole....then work your way around the circle. 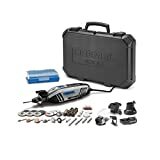 You will weave it around as many times as it takes to get a small hole in the middle, then tie a few knots and cut off, or burn any excess beyond a few inches. You want to leave enough of your sinew to attach whatever token you want to put on it ie: a feather, bead, etc. Pictures and content are copyright of Kathy McGraw and may not be used without permission. I would love to know if you have ever done any Gourd Art, or made a dreamcatcher before. Were these instructions helpful? Wow, beautifully done, Kathy ~ nice step-by-step instructions with photos! This is wonderful:) That is a great step by step guide and very lovely result! What a wonderfully creative idea! The results are fabulous! This looks like so much fun! I did woodburning on some gourds once but this is a nice project too. Glad you liked the tutorial...and for those that want to do it with kids..there is something even the youngest can do, like the shoe polish. We decoupaged all the kids pictures on it, and they had fun finding those too. I've only heard of using gourds as bird houses. Your tutorial is excellent - I love the pictures- and love the finished product. Oh, I wonder where I can get one of these gourds? Carving them looks so much fun and I'm impressed with the results. A beautiful step by step guide, Kathy. Suzanne Valadon - "The Blue Chamber"
Suzanne Valadon was a Fench circus performer, artist's model, waitress and single mother who overcame her class background and her gender to become a respected artist. Dali's work was prophetic. Scientists still struggle to explain the concepts of time that the talented artist valiantly portrayed.